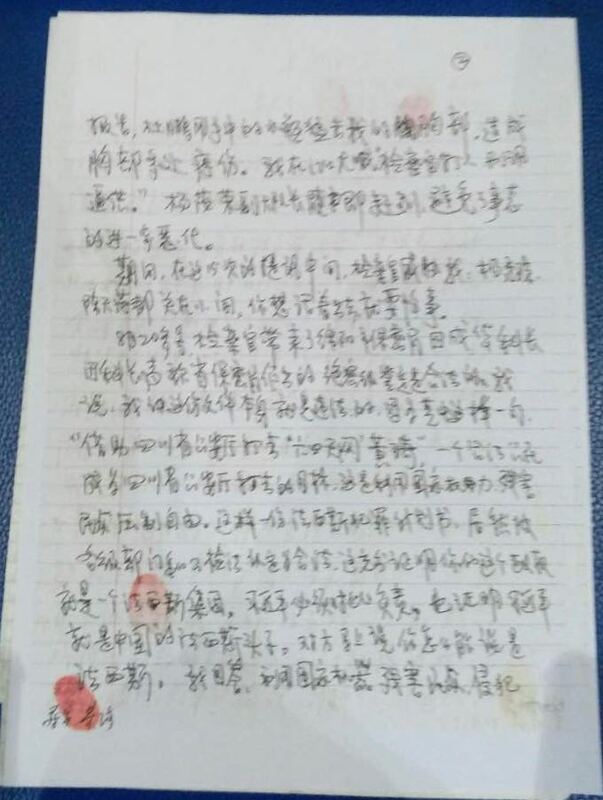 The following narrative—signed by and in the first-person voice of Huang Qi, the detained Sichuan rights activist—is excerpted from the record made by lawyer Liu Zhengqing of what Huang said to him during their meeting on September 7, 2018. 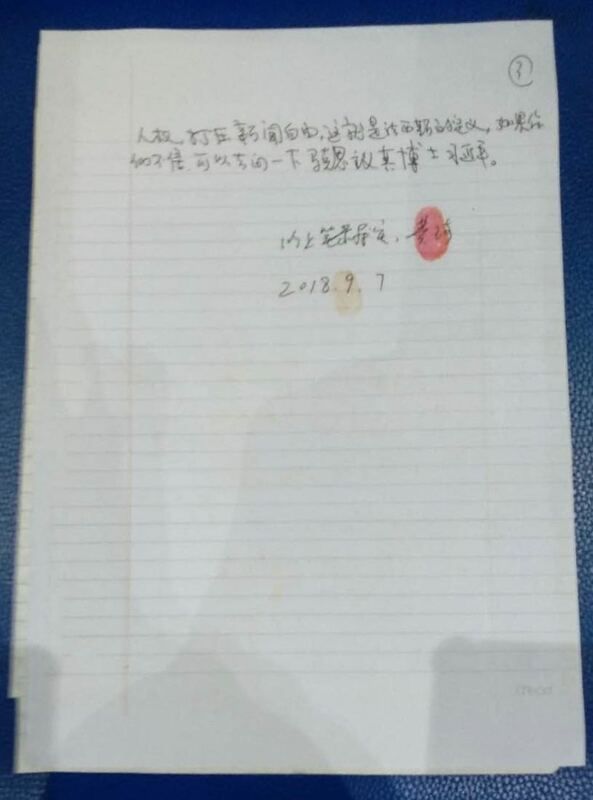 Photos of the original record in Chinese, credited to Wu Yitong (吴亦桐), were posted as illustration of a September 8, 2018 Radio Free Asia article about Huang Qi (https://www.rfa.org/cantonese/news/huang-09082018120924.html). Our translation is based on our transcription from the photos. Huang has been detained since November 2016 and indicted for “illegally providing state secrets abroad.” He is still awaiting trial. For more information on Huang Qi, see: https://www.hrichina.org/en/defenders/huang-qi. The results of my blood on August 6, 2018 were: creatinine: 214 [an elevated level indicative of kidney disease]; uric acid: 519 [an elevated level indicative of gout or kidney stones]. . . . In the following days, I repeatedly told the police about my medical conditions. From August 9 to August 12, the police did three blood tests and arranged for about 10 doctors to examine me who also conducted medical conferences. But no one has told me the results. 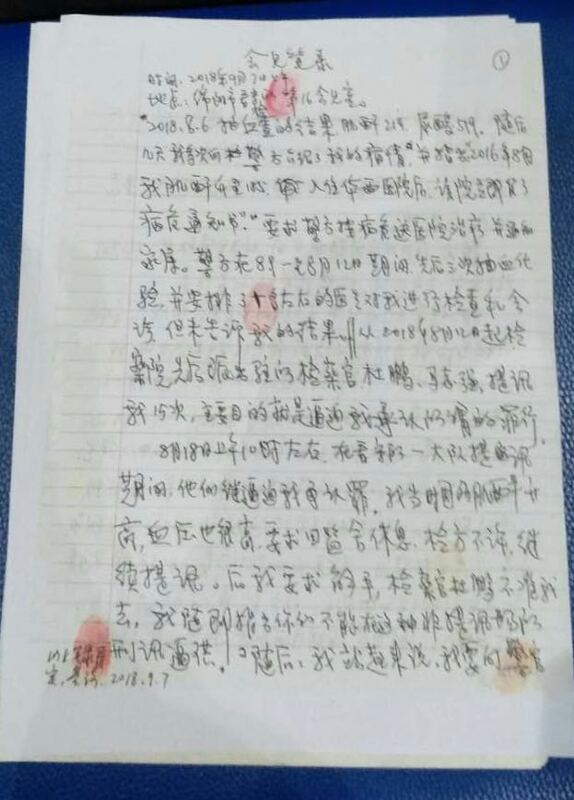 From August 12, 2018, the procuratorate sent two prosecutors based at the detention center—Du Peng (杜鹏)and Ma Zhiqiang (马志强)—to interrogate me 15 times. Their main purpose was to force me to admit to the so-called crimes. During the interrogation at about 10:00 AM on August 18, at the No. 1 Brigade [supervision unit] at the detention center, they continued to force me to admit guilt. At that time, because of my elevated creatinine level and high blood pressure, I asked to go back to the cell to take a rest. But the prosecutors refused and continued the interrogation. Later I asked to go to the restroom, but the prosecutor Du Peng refused to let me to go. I immediately pointed out: You can't interrogate me at a place that is not designated for interrogation, and you cannot make me confess by force. And then I stood up and said: I want to report this to the police officer. Then Du Peng struck my chest with a water bottle, causing multiple bruises. I shouted through the door, "The prosecutor is beating me and is trying to torture me into confessing." Yang Maorong, the deputy commander of the brigade, arrived immediately and prevented further deterioration of the situation. During the 15 interrogations, a prosecutor threatened me. He said, Yang Xiuqiong and Chen Tianmao are all in the small cells; so, be sensible if you want to get out of here alive. The above record has been verified to be true. Huang Qi, September 7, 2018.